Randy Travis gave an emotional performance that left the audience teary-eyed at the Country Music Association Awards in Nashville on Wednesday, November 2. Watch the legend take the stage in the clip above! 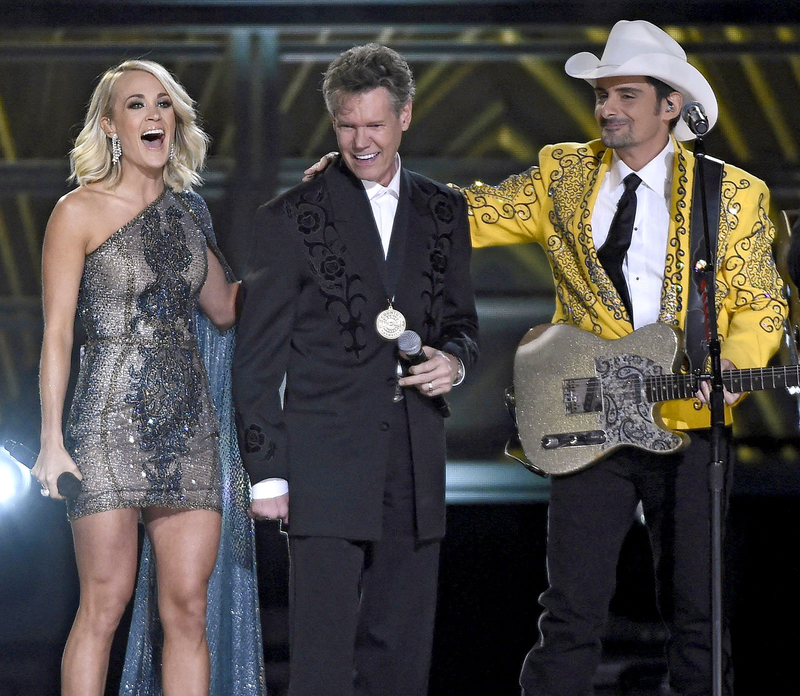 The country star, 57, who was recently inducted into the Country Music Hall of Fame, was joined on stage by CMA Awards cohosts Carrie Underwood and Brad Paisley. Travis, who struggled to regain his voice and ability to walk after suffering a life-threatening stroke in 2013, was given a standing ovation by the star-studded audience as he appeared with a who’s who of country music royalty at the Bridgestone Arena. Singers Reba McEntire, Dwight Yoakam, Clint Black, Ricky Skaggs and Alan Jackson performed a medley of country hits before a frail-looking but smiling Travis joined them on stage. The "Three Wooden Crosses” crooner stayed close to Paisley and Underwood, who each kept a protective hand on his back as the group sang his 1987 hit "Forever and Ever, Amen." CMA Awards 2016: Nominees and Winners List! “Ladies and gentlemen, the latest member of the Country Music Hall of Fame, Randy Travis,” announced Underwood. At that, Travis briefly sang the final lyric “Amen” earning him a standing ovation from stars including Keith Urban and actress wife Nicole Kidman, Jennifer Garner, Garth Brooks and Trisha Yearwood. An emotional Miranda Lambert was also seen wiping away tears while joining in a standing ovation after his inspiring performance. Travis’ CMAs appearance comes after he sang "Amazing Grace" at his Country Music Hall of Fame induction in Nashville on October 16.